Buick Regal: Where Are the Airbags? 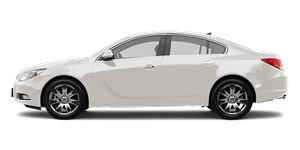 Buick Regal / Buick Regal Owners Manual / Seats and Restraints / Airbag System / Where Are the Airbags? The driver frontal airbag is in the middle of the steering wheel. The right front passenger frontal airbag is in the instrument panel on the passenger side. The seat-mounted side impact airbags for the driver and right front passenger are in the side of the seatbacks closest to the door. The roof-rail airbags for the driver, right front passenger, and second row outboard passengers are in the ceiling above the side windows. If the vehicle has second row seat-mounted side impact airbags, they are in the sides of the rear seatback closest to the door.